Of course, the best known laundromat in Quartzsite is probably the Main Street Laundromat & Showers (205 E Main Street). I did laundry there once, and it was a fine experience, nothing exceptional or special. I did like that it opened at 6 am so I could get my clothes washed and dried early in the day. Other laundromats in Quartzsite include Fill-R-Up & Corner Laundromat (10 N. Central), about which their website says, “Longest running dryer time for your money” and “Somebody is always on site to help.” Google also lists Palm Plaza Laundromat (225 N. Central Blvd.) and Bud’s Suds (543 W. Main Street). Most grocery stores, fast food restaurants, and gas stations in Quartzsite have trash cans out front. If you have a small bag of trash, dispose of it while filling your gas tank or as you walk into a store or restaurant. If you rather collect your trash in large bags or if you have accumulated several days worth of trash, you may need to visit the dump, aka the Quartzsite Transfer Station. The dump is located north of town on Highway 95; the phone number is 928-669-8886. According to the Wastebits website, the hours of operation are Sunday through Wednesday from 7:30 am to 2:30 pm. I forgot to say it at first, but a reader reminded me that there is no charge to dump your trash at the Quartzsite Transfer Station; the service is FREE! 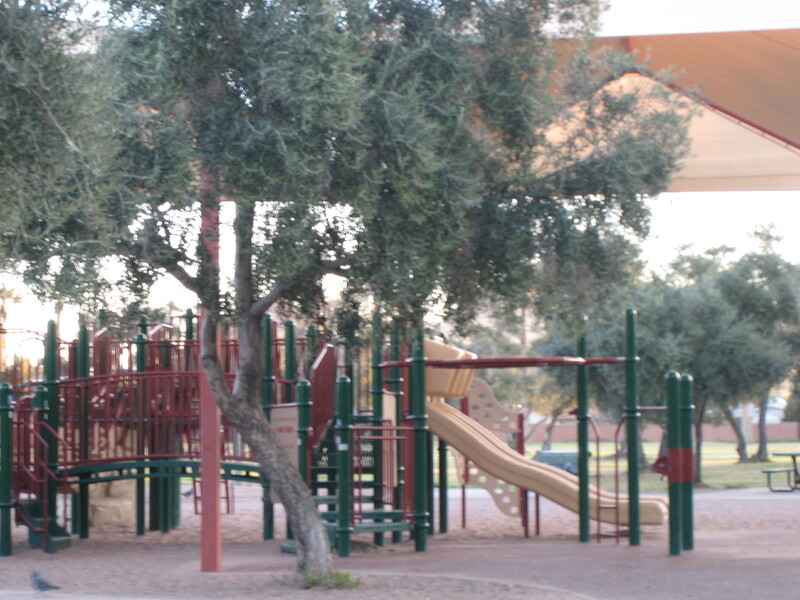 There’s a lot to do in the 40 acre Quartzsite Town Park. Google reviewers listed the following amenities within the park: mini tennis, basketball court, horseshoe pits, two covered play structures for younger and older kids, dog park, skate park, bike course, motto x course, plenty of shaded tables, baseball diamond, grassless football/soccer field, small R/C car track, model airplane strip, and a dance slab. In 2017 during a visit to Celia’s Rainbow Gardens, I also saw a disc golf course out there. 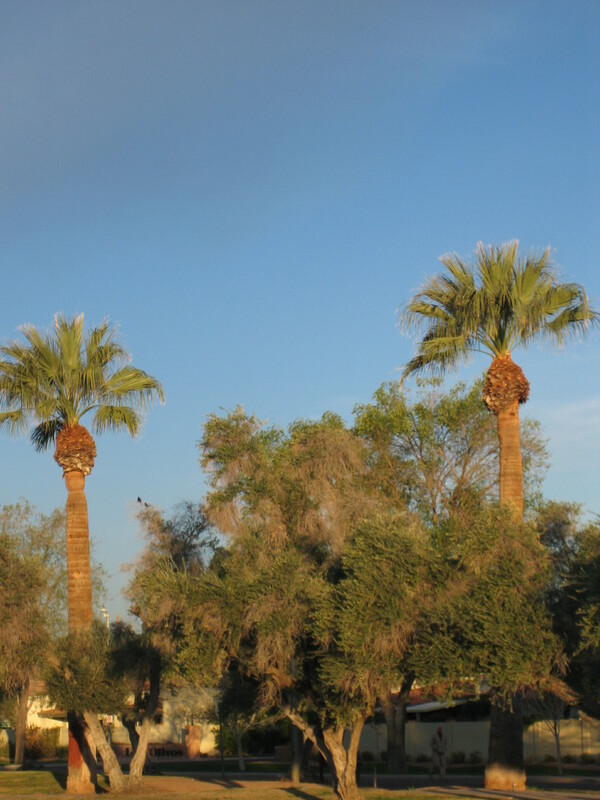 Celia’s Rainbow Gardens are within Quartzsite Town Park. 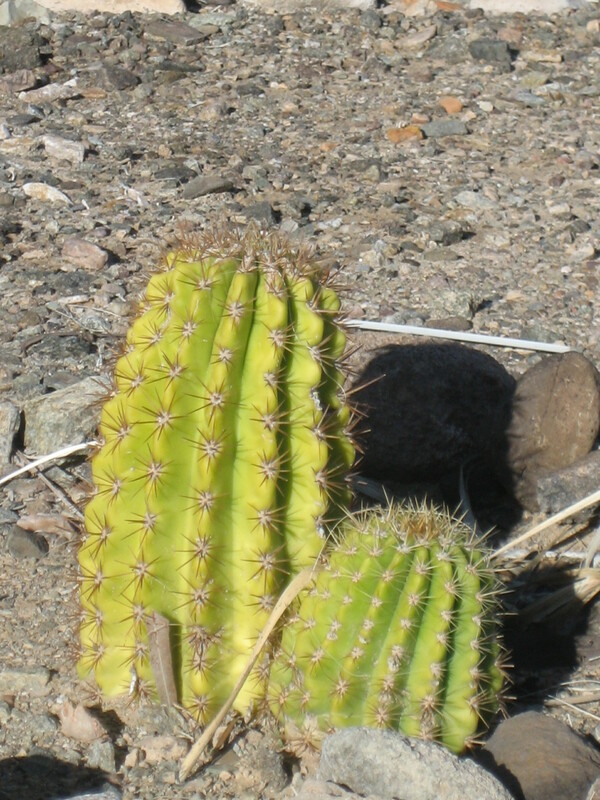 Within those eight acres, one can find a botanical garden of sorts, with lots of different species of cacti, palm trees, and other plants; an archway with bells at the entrance to the gardens called The Hero’s Bell Garden; a palm tree plaza; an area with mining equipment donated by the BLM; the RVing Women memorial area; Adamsville, a miniature village; and memorials to Quarzsite folks who have passed away. 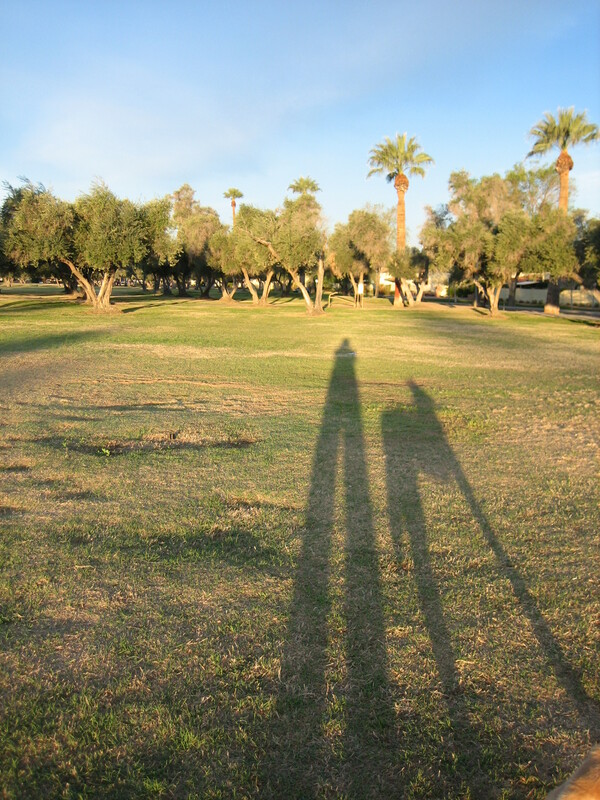 Winter is a great time to be outdoors in Quartzsite, so go have some fun in this huge recreation area. Just don’t forget sunscreen, a hat, and plenty of drinking water! The desert is no joke, even in the winter. In 2015 I visited the Tyson Well Stage Station Museum (161 West Main Street). Admission was free (and it still is, according to the museum’s website), so it was worth the visit, but I can’t say I was impressed by the exhibits. I thought there was too much stuff crammed into too small a space. Many pieces were on display with no explanation as to why they were there. Of course, the museum could have changed for the better in the last few years, so I urge history buffs to check it out. 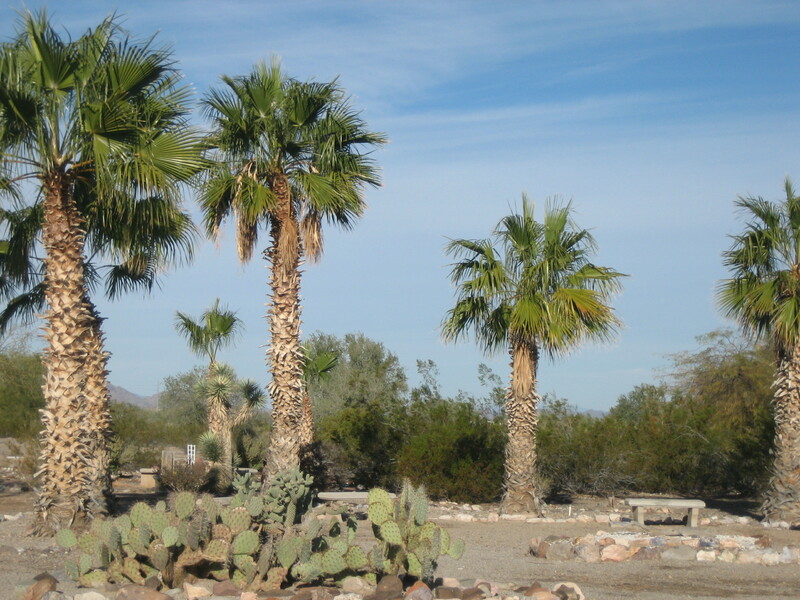 The Hi Jolly Cemetery is operated and maintained by the Town of Quartzsite for the purposes of providing a cemetery, historic site and park. 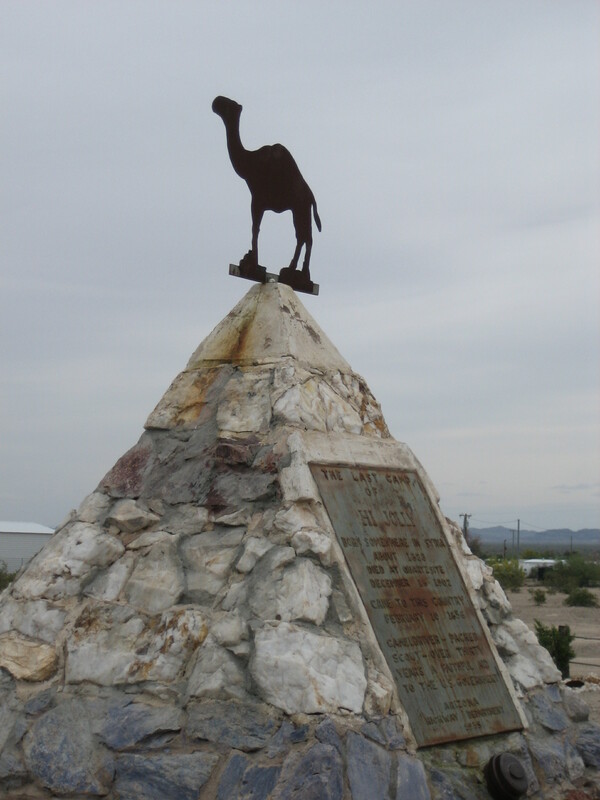 The Hi Jolly monument is in the pioneer section of the cemetery where Quartzsite’s pioneer families were and are laid to rest. There is a new section to the cemetery also for those who chose to be interred in Quartzsite. In the spring of 2015, I stopped at the Hi Jolly Pioneer Cemetery on my way to California. I picked up a booklet with a map of the graveyard at the cemetery’s information kiosk. The booklet offered biographical information about many of the people buried in the cemetery. If you can get your hands on a copy of that booklet, you can learn a LOT about the non-native people who settled Quartzsite. Whenever I go to a town, I like to browse the thrift stores to see what goodies are available. I don’t need much more stuff in my life, but I do like to look. As far as I know, there are three thrift stores in Quartzsite. The Salvation Army Thrift Store (101 Moon Mountain Rd.) is across the street from the Isaiah 58 Project. Parking is in the gravel lot in front of the store. It has a small selection of mass-market paperbacks, cheap VHS tapes, and a few CDs. There is usually a large selection of housewares, pots and pans, plates and glasses. The selection of linens and pillows tends to be small, and the items seem well used. The shoes available also tend to be well used, and I’ve never seen clothes here that I like in my size. Prices are reasonable. Most clothing costs a dollar or two per piece. Many things in the housewares section are 50 cents to $1. Small toys are very inexpensive, as are greeting cards. The Quartzsite Community Thrift Store (7 Showplace Lane) is located near the end of the street that runs along the side of Silly Al’s pizza place. The parking lot is also gravel and in front of the store. 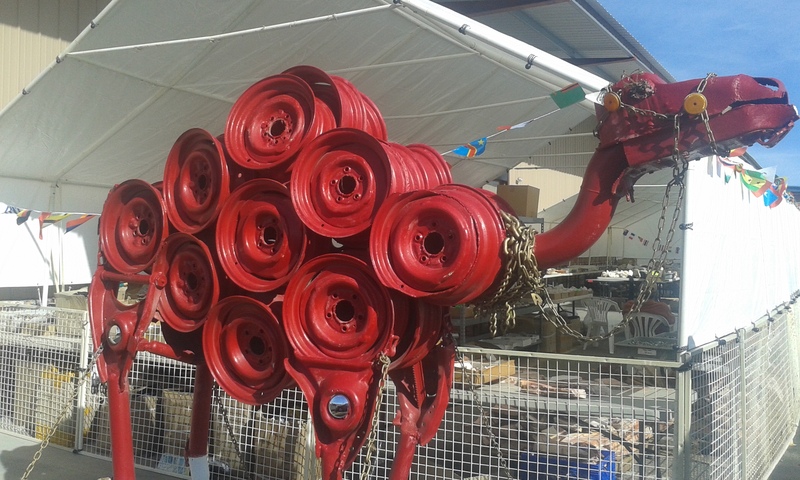 The store offers some higher-end decorative items near the front of the store. The price of women’s clothing seems to start around $2; I’ve never seen clothes here that I like in my size either. I have found good prices on yarn at this store—50 cents to $1 a roll. There’s a decent-sized selection of books in the second room, as well as mostly inexpensive housewares and a small selection of well-used linens. The Animal Refuge Thrift Store is on the other side of town, east of Central (Highway 95), on the south side of Main Street. In 2016, the store was filled with only the best merchandise, and the higher prices reflected the nicer inventory. Since I’m never really looking for higher end items, I haven’t been back to this thrift store since my visit several years ago. a non profit, community based, volunteer group of people wanting to help the Quartzsite area and all the wonderful visitors we get here every year. The calendar shows the group’s scheduled events, trade shows, dances, classes and, of course, their biggest event of the year, the gem and mineral show called the PowWow. If you want to exercise, listen to live music, play bingo, learn Spanish, or dance, check out what the QIA has to offer. also has lots of activities for snowbirds and show visitors. If you are interested in any of these activities or want to know what special events might be in the works at the senior center, give them a call at 928-927-6496. When part 1 of this post ran on Wednesday, someone on Facebook said I had “forgot to mention the 3 most popular places…” in Quartzsite. Those places are apparently Beer Belly’s Adult Daycare (121 W Kuehn Street), Silly Al’s Pizza (175 W Main Street), and Quartzsite Yacht Club Restaurant Bar and Grill (1090 W Main Street). I’ve never been to any of these places, so I don’t know how much entertainment any of these places offer. A friend of mine told me last year that the food at Silly Al’s is really good; maybe I’ll get to try it someday. 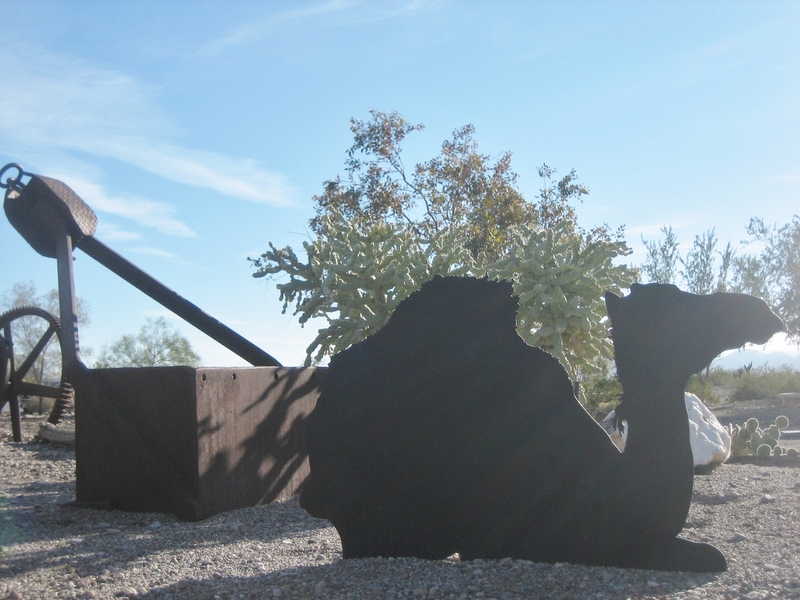 Where won’t you find shiny rocks in Quartzsite in the winter? Both Tyson Wells (121 W. Kuehn St.) and Desert Gardens Internationale Rock, Gem and Mineral Show (1050 Kuhen Street) are good places to look for gems and minerals. The official Tyson Wells Rock & Gem show will be held January 4th-13th, 2019; show hours are 9am to 5pm each day. If you like shiny rocks, don’t miss the QIA PowWow (235 Ironwood St.) running January 16 through January 20, 2019. All the merchandise displayed by vendors must be 75% gem, mineral or jewelry related. 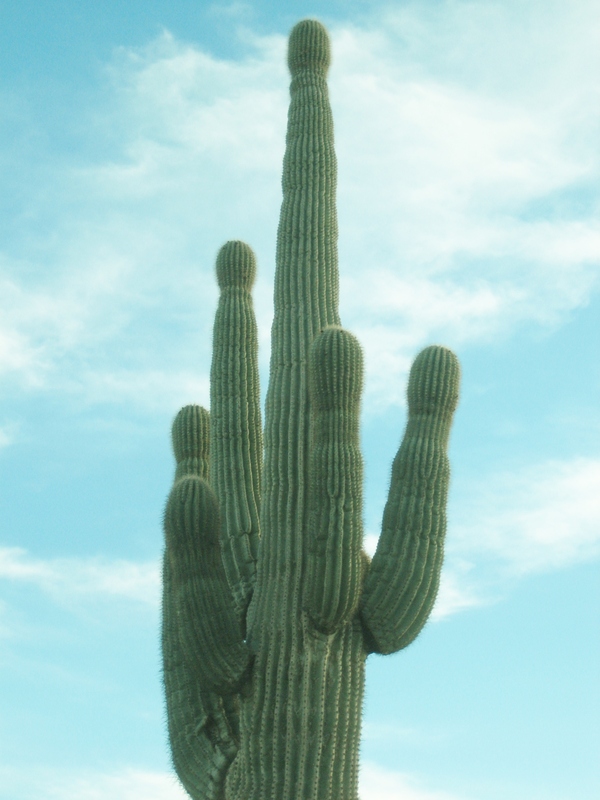 I hope my knowledge of Quartzsite helps you find the things you want and need while you are there. I’ve not been compensated for mentioning any of the businesses included in this post. All the information shared is based on my own experiences and what I found on the internet. Please do your own research, including calling businesses to determine if the information I shared is accurate and if the services I mentioned meet your needs. You are responsible for your own self. I’m not responsible for you. I apologize for any information that is no longer accurate, but offer this post to you as a starting point. I took all the photos in this post. In February 2015, I had a house/dog/cat sitting gig at a home across the street from Los Olivos Park in Phoenix, Arizona. On the first morning I was there, I took photos while the dog and I were out for our morning walk. This was the sunrise we saw as we started our walk. 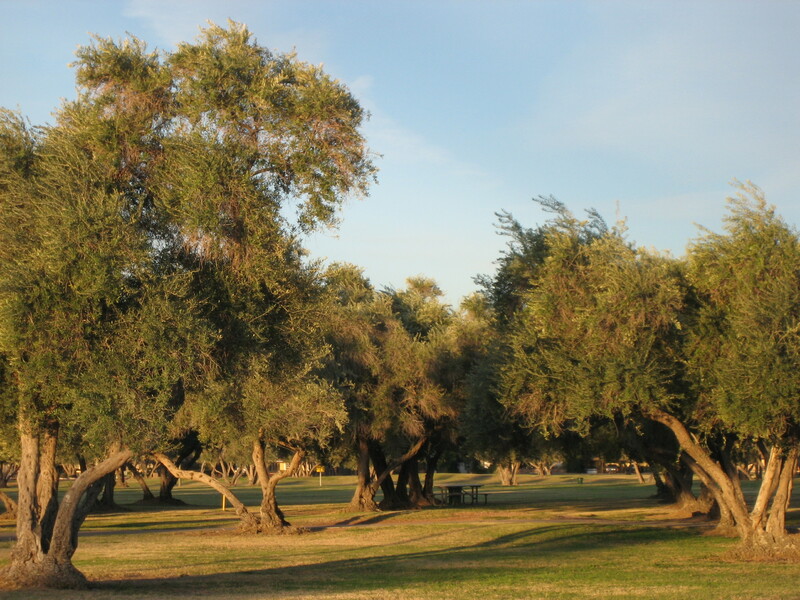 Los Olivos Park was originally an olive grove. Hence the name. Hence the olive trees growing in rows. 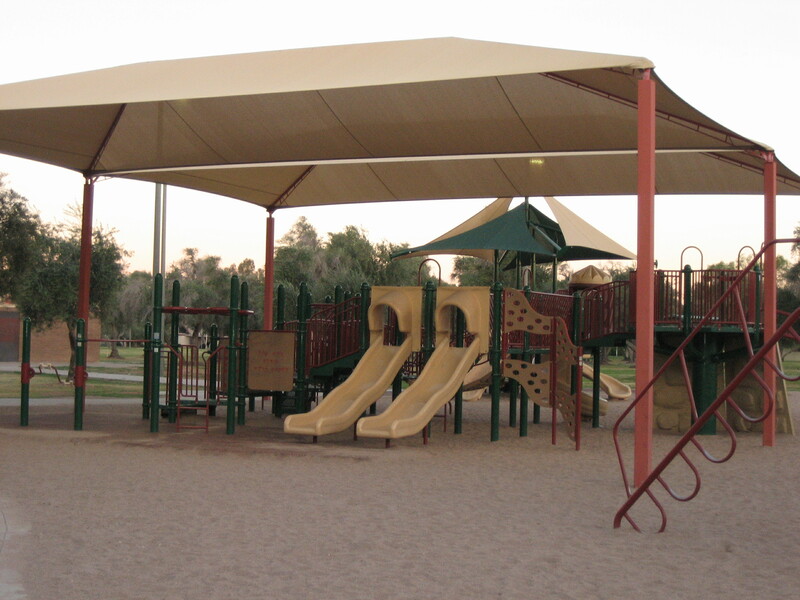 The park has a really nice, big, covered playground for kids. There are many picnic tables scattered throughout the park and even some barbecue pits. Unfortunately, only two of the picnic tables are under a shelter. (That’s two tables under one shelter.) So in the long, hot Phoenix summer, if you and your friends want to sit at a picnic table, you might get some shade from a nearby tree, but you’re mostly going to be in the sun. The woman I was house sitting for told me that on weekends she sees one person stake out the covered shelter territory early in the morning in preparation for a party later in the day. 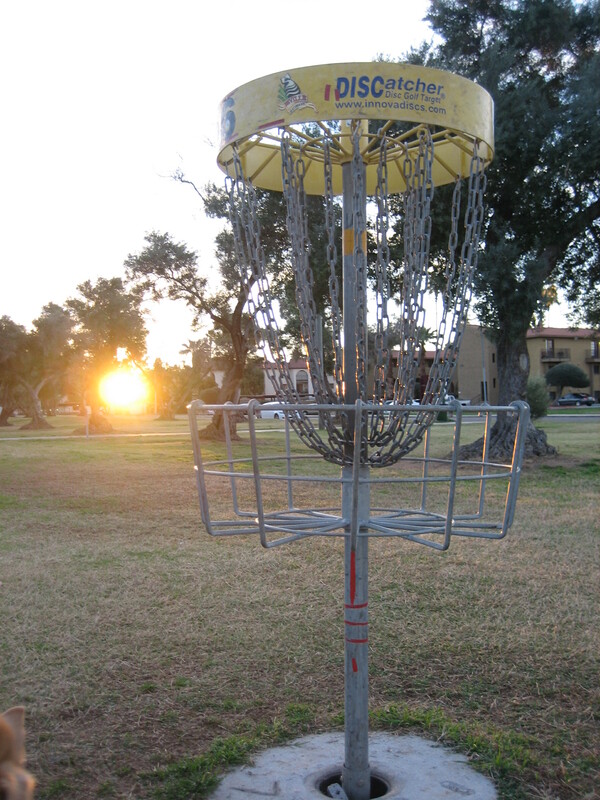 The park also boasts a disc golf course. On Friday afternoon, there were several groups playing disc golf. A concrete jogging/walking path winds through the park. 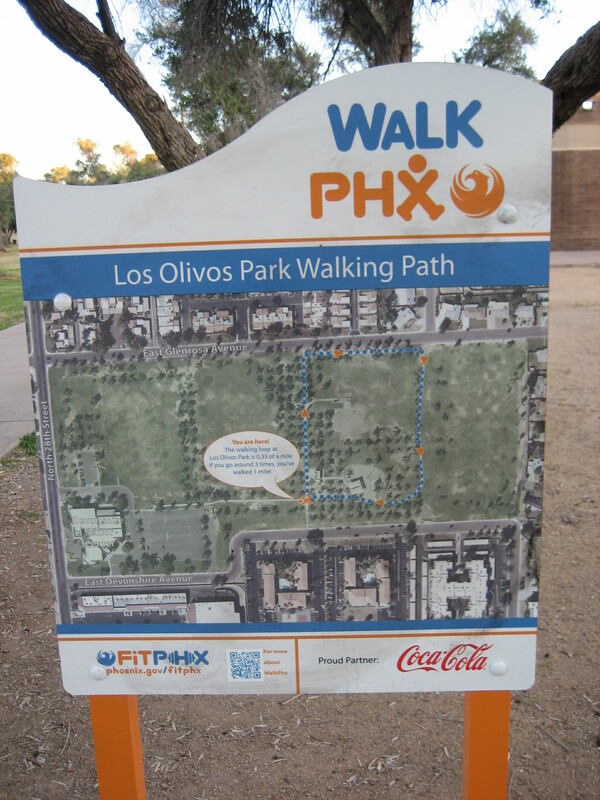 Along the path, there are exercise stations where folks can stop and do a specific workout. There are two sand volleyball courts too. It’s hard to get a good photo of a net, so I didn’t even try. Even with the big playground, picnic tables, a walking/jogging path, and disc golf and volleyball courts, there’s still plenty of room in the park to toss a Frisbee, kick a soccer ball, play catch, or just run around and spin in circles. 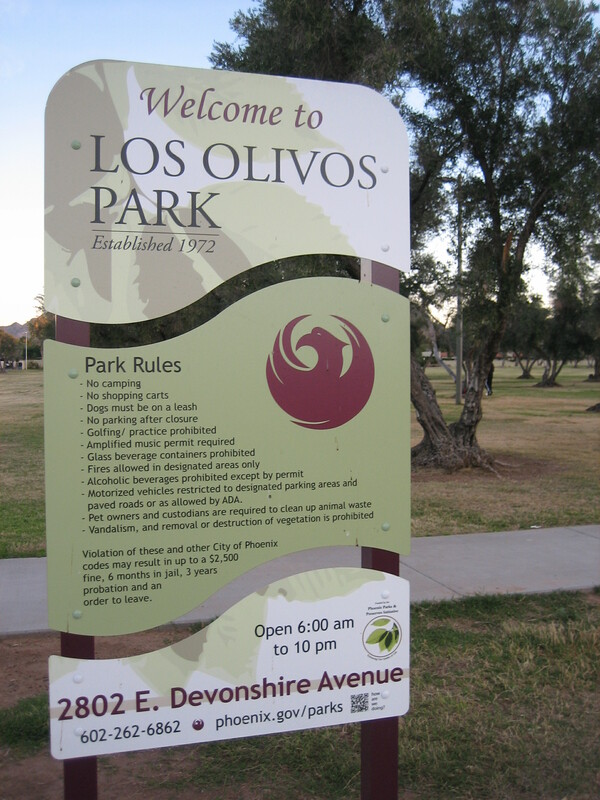 Los Olivos is a huge park. 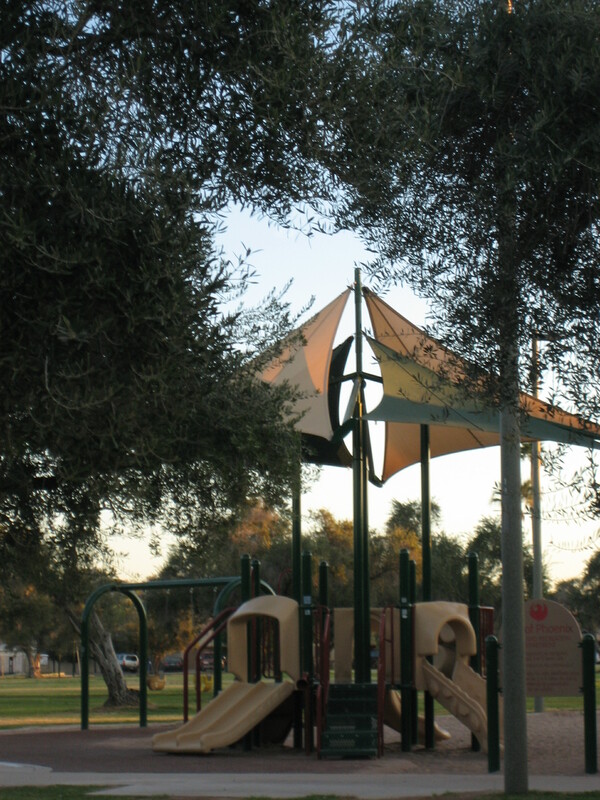 If you have to use the facilities while in Los Olivos park, there are facilities to use. 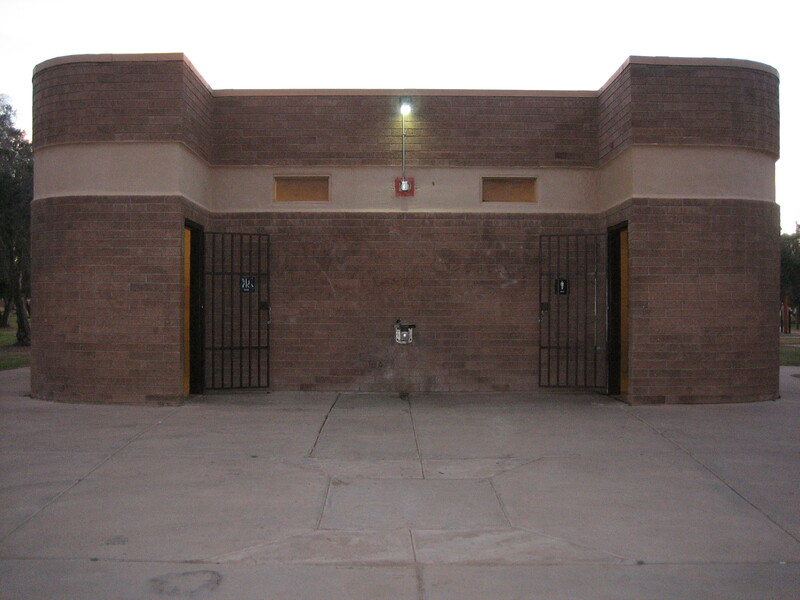 This is the restroom building. It kind of looks like a jail. I didn’t actually have to use the facilities, but I peeked in, just to see what it looked like. It wasn’t horrid or terribly dirty. It was better than park restrooms I’ve seen in New York City and Richmond, Virginia. As the dog and I were wandering around the park before 8 o’clock on a Saturday morning, a city truck pulled up to the restroom building. Workers were cleaning the restrooms. Along with the olive trees in the park, there are some palm trees. 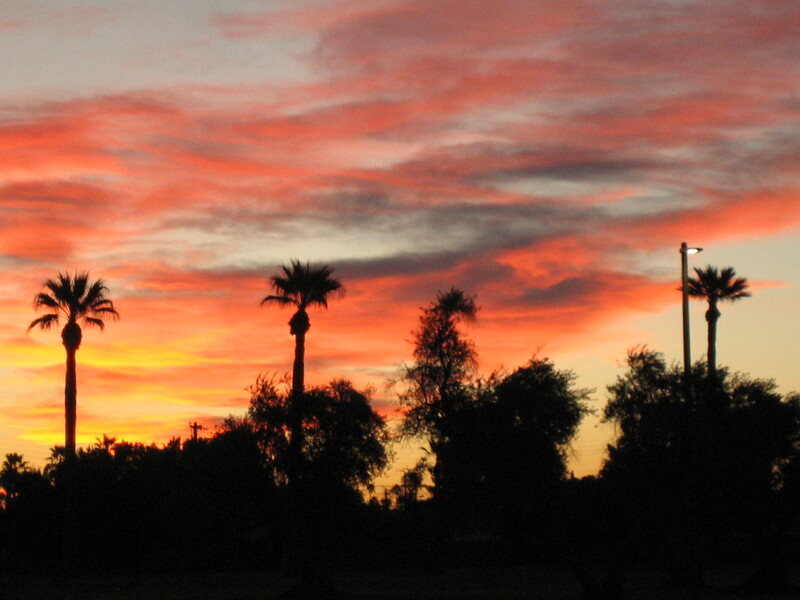 Palm trees are not native to Phoenix. Well, neither are olive trees, for that matter. Learn more about the palm trees in Phoenix here: http://www.examiner.com/article/the-palm-tree-story-of-phoenix and the olive trees in Phoenix here: http://www.garden.org/regional/report/arch/inmygarden/3656. Dogs are allowed in the park (obviously, or I would not have been walking the dog there). There are signs in the park stating that all dogs have to be leashed at all times. Not everyone follows this rule, so anyone visiting with a dog companion should be cautious and alert. The park is open from 6am until 10pm. There is plenty of parking on the streets on both sides of the park, but there are signs saying it is illegal to park in those spots from 10pm until 6am. Parking is also allowed in the two good sized lots behind and on the side of the senior center. The entrance to the back lot is off of Devonshire and the entrance to the side lot if off of Glenrosa. I’m sticking to the union, I’m sticking to the union. I’m sticking to the union ’til the day I die. I thought that was a little bit weird, but it made me happy too. I took all of the photos in this post.